This recently renovated studio apartment has a privileged location, a stone's throw from the Palais de Festivals and 1 minute to the Croisette. It has an entry with large closet, bathroom with large shower with integral seat, a living room and kitchen. The living room has a large quality bed 160cm wide for 2 persons. This recently renovates apartment of 25sqm has a privileged location on the Croisette, just steps from the Palais des festivals. 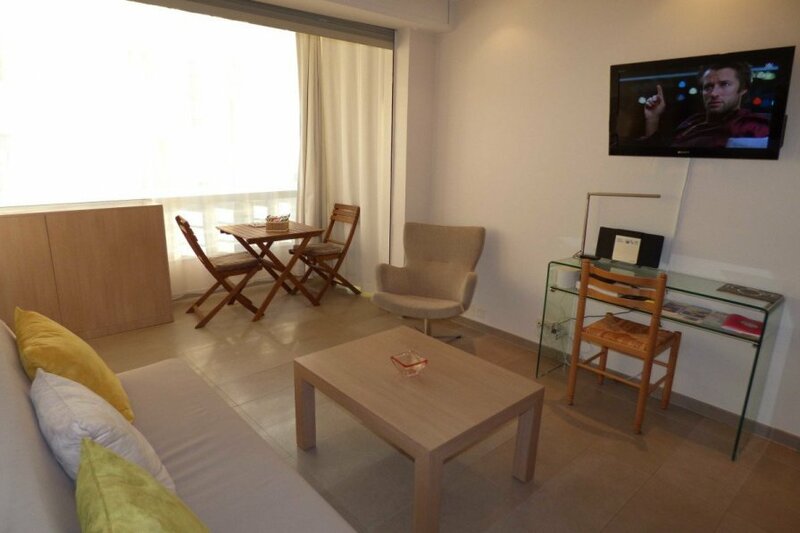 You will find in this apartment all the equipments necessary for your stay. You should be delighted with this apartment and its fantastic location and we are only a telephone (or a few steps) away for any questions, additional wishes, or eventual problems in order to make your stay in Cannes a very memorable one. Although this apartment is part of the Grand Hotel residences, it is independent and separate from the hotel. Nevertheless, if you wish, you can have breakfast, have access to the bar of the hotel or to the restaurant (paid service).